Crunchy peppers and onions mixed with mayo and tuna and grilled up warm and crunchy with melty cheese. That's diner fare you can feel smart about. 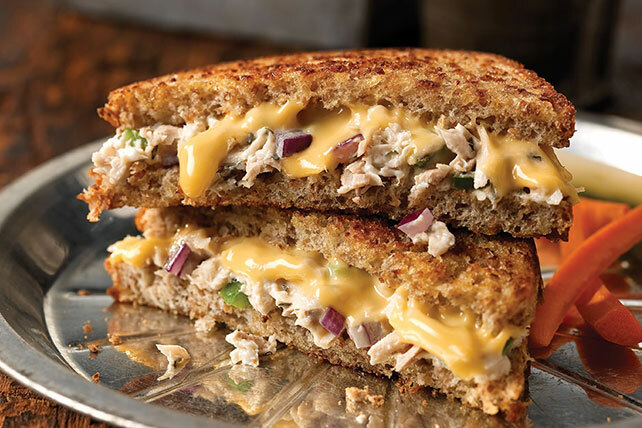 Fill bread slices with tuna salad and 2% Milk Singles to make 4 sandwiches. Cook in large nonstick skillet on medium heat 3 min. on each side or until Singles are melted and sandwiches are golden brown on both sides. For an added touch of buttery flavor, try NATURE’S OWN Butterbread. With no artificial preservatives, colors or flavors, it’s a delicious choice. Substitute chopped carrots and cucumbers for the onions and green peppers. Substitute MIRACLE WHIP Light Dressing for the mayonnaise.